U.S. President Donald Trump and Colombian President Ivan Duque in the Oval Office of the White House, Washington, Feb. 13, 2019 (AP photo by Evan Vucci). 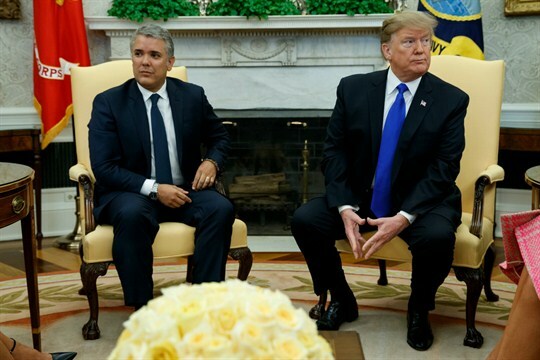 In one of his latest displays of undiplomatic impulsiveness, President Donald Trump unexpectedly slammed the closest ally the United States has in Latin America, Colombian President Ivan Duque. The comments startled Duque and much of Colombia, highlighting the risks to politicians everywhere who align their fates too closely with a president like Trump, who is not only unpopular in their own countries, but who also has a penchant for mistreating Washington’s friends.